The Great Barrier Reef Marine Park Authority is responsible for ensuring the Great Barrier Reef Marine Park — one of the world's greatest natural treasures — is protected for the future. The Reef Blueprint for Resilience is the primary output of the 2017 Reef Summit, attended by 70 regional, national and international delegates representing marine park managers, Traditional Owners, government agencies, research institutions, industry groups, Reef users and other stakeholders. The Blueprint signals the actions we will take with our partners to strengthen the Reef’s resilience, its capacity to recover after disturbances and return to a healthy state and the challenges it faces now and in the future. Our message is: together we can secure the future of the Reef – we have to try harder, do more and act now. This Blueprint outlines additional actions and innovative approaches the Authority will pursue with its partners to better support and protect coral reefs in the face of a changing climate. By focusing our efforts, we will give the entire Great Barrier Reef ecosystem its best chance of coping with the challenges ahead. From Blueprint to Action examines the first year of progress by the Authority towards achieving the initiatives of the Reef Summit held in May 2017 and the subsequent release of the Great Barrier Reef Blueprint for Resilience in December 2017. Collaborating with its many partners on behalf of Australia and the world, the Authority’s management efforts are focusing on maintaining and strengthening successful strategies while developing and adopting new technologies and innovative measures. Read the full report , or review a summary of the main initiatives below. Please note: This content reflects the information published in October 2018, so Action Updates may be out-of-date. In 2018 the health of the Great Barrier Reef remains deeply concerning. Climate change poses the biggest and most immediate threat to the Reef’s survival with rising sea temperatures forecast to bring destructive marine heatwaves; increasingly frequent and severe storms damaging reef structures; and more droughts and floods affecting the amount and quality of water run-off into coastal catchment areas. Mass coral bleaching and a severe tropical cyclone have impacted 80 per cent of the Great Barrier Reef since 2016, resulting in an estimated loss of at least 50 per cent of the Reef’s shallow water corals. Areas of the remaining healthy coral are critical for the Reef tourism industry and long-term ecological recovery. The full impacts of recent events are only beginning to be realised. Emerging data indicates fish species dependent on coral reefs for food and habitat are in subsequent decline. The latest reef survey results from AIMS confirm the highly variable patterns of disturbance and recovery from the Reef. Northern region (Cooktown north) – data from early 2017 (before Cyclone Debbie) indicated that mean coral cover had dropped to about 10 per cent, less than half of what it was in 2013. Central region (Cooktown to Bowen) – data assessed for the 2017–18 period showed the mean level of coral cover has dropped form 22 per cent in 2016 to 14 per cent in 2018. Southern region (Bowen south) – mean coral cover dropped from 33 per cent in 2017 to 25 per cent in 2018. With changes happening faster than predicted and with the forecast of decades of worsening conditions ahead, coral reefs that need between 10 to 30 years to recuperate from related impacts will be in a constant state of recovery. The future state of the Great Barrier Reef relies on immediate international action to urgently reduce global warming. This must happen in parallel to Australia fast-tracking resilience-building actions in the Reef’s catchment and waters. Understanding why some reefs are more resilient to disturbances enables us to target resources towards actions that better support corals. A resilience network has been identified, evaluated and is the focus of additional management efforts. A decision-support tool is being developed that can evaluate a complex array of data for specific reefs or groups of reefs. The Authority is leading a project to develop an ‘Interim Resilience network Decision-Support Tool’ in partnership with CSIRO, AIMS and James Cook University. To date, information from key data sets and key experts has been collected, collated and analysed. The ‘prototype’ decision-support tool and report are expected to be finalised this year. Findings from using the tool will inform the project’s next steps. A doubling of field management resources over the next five years will see a sustained expansion of compliance activities including more ranges on the water and a second 24-metre vessel. The benefits of marine parks zoning to the resilience of coral reefs is maximised through high levels of compliance. The Australian and Queensland governments’ Reef Joint Field Management Program received an increased funding commitment of more than $17 million per year to $38 million by 2022. The stages release of funds allows for a considered and sustained expansion of front line compliance activities including a second 24-metre vessel Reef Resilience capable of operating Reef-wide. The implementation of vessel monitoring systems on all commercial fishing vessels is on track for completion by 2020 as part of the Queensland Sustainable Fisheries Strategy. Compliance risk and threat assessments have been updated to include the effects of mass bleaching events. The on-water presences of marine park rangers and other partners has been expanded with training already underway for a further 23 rangers. Recreational fishing compliance blitzes have begun targeting illegal fishing hotspots where anglers poach from no-take zones. New technologies are being adopted – including UAVs – to enhance surveillance capacity of field officers. A new compliance operations centre equipped with up-to-date technology is now open. More information on the Authority’s Field Management capabilities. Increased funding now makes an all-out assault on crown-of-thorns possible. The crown-of-thorns starfish population is suppressed to minimise coral predation and maximise coral cover. In April 208 the Australian Government committed $58 million over six years, as part of the Reef Trust – Great Barrier Reef Foundation Partnership – to ramp up crown-of-thorns starfish control. The Authority's Crown-of-Thorns Starfish Strategic Management and Contingency Plan is being finalised for publication. An open tend process has been completed and a panel of suppliers has been established to deliver the additional vessels and trained crews for program expansion. Collaboration with the research community through the National Environmental Science Program’s Integrated Pest Management project has enabled a number of new initiatives which will further enhance the effectiveness of crown-of-thorns starfish surveillance and control. Coral and starfish density thresholds are now used to inform vessel schedules and cull efforts. Additional funding has allowed for an increase in capacity for rangers to undertake surveillance. Improvements have been made to the data management with the development of a new data capture tool to manage the information coming in from the vessels and a visualisation tool to track progress in outbreak control. Program evaluation practices have improved by surveying starfish numbers and coral cover on reefs where there is no culling. More information on crown-of-thorns starfish control program. Researchers are investigating which species are most important to the ecological processes supporting Reef functioning and recovery. Species with a key role in assisting reef recovery following disturbance are identified and protected from unsustainable pressures. 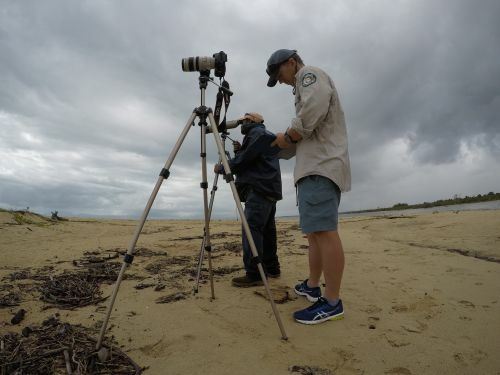 The University of Queensland is leading work on the identification of species that are critically important to maintaining and assisting ecosystem functioning including recovery processes. A framework has been established for examining which species are the most important to Reef functioning. Collation and synthesis of existing material is underway and workshops with scientists and managers have been convened with an initial focus on the biological processes that support Reef health and resilience. The outcomes from this project will be publicly available in mid-2019. More information about threats the Reef. Over $100 million has been committed to develop reef restoration solutions that can be logistically and feasibly deployed at a large scale to help the Great Barrier Reef’s ability to recover from climate-related disturbances. Coordinated restoration trials are in place at demonstration sites, providing opportunities to test, evaluate and – where appropriate – scale-up restoration methods to ecologically relevant scales. In January 2018 the Australian Government announced $6 million in funding to develop a Reef Restoration and Adaptation Program to investigate the best science and technology options for helping the Reef recover and adapt to the changing environment. The Reef Restoration and Adaptation Program is in its first stage, assessing the feasibility and risks of a broad range of potential ideas and techniques to build resilience and recovery. 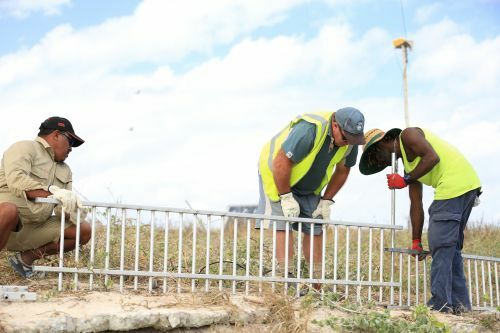 Work continues on the Raine Island Recovery Project – restoring the world’s largest green turtle hatchery. Further trials of larval re-seeding to enhance coral growth occurred at Heron Island in November 2017 thanks to additional funding provided by the Australian Government. The remediation of Douglas Shoal is expected to provide valuable lessons to support broader Reef recovery and restoration efforts. The increase in marine parks rangers and vessels is set to have a flow-on effect for on-ground restoration works with planning underway for more reef health surveys. The Reef and Rainforest Research Centre is investing $2.2 million in Australian Government funds into trialling new technology for reducing the heat stress that causes coral bleaching. The Indigenous Reef Advisory Committee engaged with AIMS to discuss the Reef Restoration and Adaptation Program, encouraging consultation with Traditional Owners as the program develops. Queensland Parks and Wildlife Service has teamed up with local partners Reef Ecologic Pty Ltd and Sealink Queensland to restore the health of coral reefs around Magnetic Island as part of the Great Barrier Reef Recovery Magnetic Island initiative. More information about the Reef Restoration Program. Many actions are needed to save the Great Barrier Reef. It is only the combined effect of all actions – big and small – that will overcome the threat of climate change. The Great Barrier Reef and coral reefs globally are a focus of policy discourse and programs to reduce carbon emissions. Great Barrier Reef communities and industries are demonstrating leadership in emission reduction efforts and climate change adaption. Activities to reduce greenhouse emissions and make the transition to a low carbon economy is now gaining momentum across individuals, communities, the corporate sector and governments. The Great Barrier Reef Ministerial Forum approved an updated Reef 2050 Plan which has a stronger focus on climate change as a key pressure. In June 2018, the Northern Australia Infrastructure Facility announced support for a $516 million conditional loan for a large-scale solar and hydro project in North Queensland — an important part of the energy market’s transition to lower emissions renewable energy sources. The Australian Government’s Clean Energy Finance Corporation announced its tenth investment in a large-scale wind project in May 2018. In September 2017, the Queensland Government committed to achieving zero net emissions by 2050 and generating 50 per cent of the state’s energy using renewable sources by 2030. Citizens of the Great Barrier Reef continued to build an online global movement for community action on climate change and reef conservation during 2018. The Authority is in the final stages of drafting its official position statement on climate change threats to the Great Barrier Reef. More information about how we manage and protect the Reef. The call for action is being heard. People are rallying behind efforts to tackle threats, large and small, to the Reef. Individuals, industries and communities are aware of the challenges facing the Reef, participate in efforts to protect it, and are inspiring intergenerational change. New funding is supporting coordinated efforts to achieve widespread collective change and build stronger networks to fast-track proven approaches, share knowledge, generate new ideas and trial new approaches. In April 2018 $444 million was committed to the establishment of the Reef Trust – Great Barrier Reef Foundation Partnership – to support the delivery of four Blueprint initiatives: crown-of-thorns starfish control; Reef restoration; partnerships for action and innovation; in addition to driving improvements in water quality. The International Coral Reef Initiative (ICRI) — of which Australia is a founding member — contributed to the Reef Summit and shared its outcomes with ICRI members. Australia will host the ICRI General Meeting in 2019 with a theme of ‘managing for resilience’. Led by the Great Barrier Reef Foundation, the Reef Islands Initiative was launched in April 2018 to establish a network of climate change refuges for protecting critical habitats and species across five Great Barrier Reef islands. Lady Elliot Island is the first to be included in this project. The Aboriginal and Torres Strait Islander Heritage Strategy was released for public comments with Traditional Owners, community members, industry bodies, Indigenous organisations, and government agencies providing advice. Partnerships with Traditional Owners are delivering benefits for Aboriginal and Torres Strait island communities and the Reef, including the Traditional Use of Marine Resources Agreements, which support Traditional Owners’ involvement in compliance management, research, education and youth-focussed activities. Great Barrier Reef Legacy launched its Search for the Super Coral Expedition in November 2017, with 10 teams of scientists studying climate-related impacts and searching for the most resilient corals. In May 2018 the Australian Government called for tenders to coordinate and delivery marine debris clean-up activities, as well as promote education and awareness of ways to prevent marine debris in the Great Barrier Reef, with $5.5 million of funding available over the next five years. Not-for-profit group Tangaroa Blue has continued its efforts to reduce marine debris with the launch of the Australian Marine Debris Initiative app in June 2018, providing a platform for citizen scientists and partners to contribute data from their clean-up activities to a central database. In November 2017, Reef Ecologic led a three-week capacity building program for coral reef managers and leaders from across the world as part of the Australian Awards International Coral Reef Management and Leadership Program. The past 12 months has seen the ongoing involvement of school children in activities to reduce threats to the Reef, including annual Future Leaders Eco Challenges. The Authority has continued to partner with local government authorities through its Reef Guardian program. The new term of Local Marine Advisory Committees started in July 2018 with about 180 community members volunteering their time to provide advice and input on the management of the Marine Park. The 2018 Reef Guardians stewardship grants program has provided seed-funding to communities for bringing people together to participate in local Reef protection projects. It’s important for Marine Park policy and legislation to function as ‘enablers’ to enhance the delivery of appropriate interventions, innovations and participation for building Reef resilience. Government policy supports resilience-based management of the Great Barrier Reef by facilitating appropriate interventions, innovations and participation by communities and businesses. In February 2018, the Authority released its Draft Reef Intervention Guidelinesand Draft Reef Intervention Guidelines – Supporting Information. The draft guidelines provide greater clarity on how the Authority ensures these projects do not have an adverse impact on the biodiversity, heritage, social or economic values of the Marine Park. More information about legislation, regulations, agreements and policies. Improving the accessibility and timeliness of information to guide Reef actions and ensuring management is underpinned by the best available science. Timely and salient information is publicly available through decision support systems to inform future-focussed adaptive resilience-based management. In April 2018 the Australian Government committed an additional $40 million to support the Reef 2050 Integrated Modelling and Monitoring Program’s transition from the design phase to an operational system. A comprehensive report is being prepared on the program’s recommended design. A new website or the program was launched in March 2018 to improve access to information on its development. The Authority is working with scientists from the University of Queensland to develop a prototype decision support system to help prioritise reefs for enhanced management attention. Targeted communication campaigns are raising awareness and promoting grassroots efforts to curb major threats to the Reef. Efforts to protect and build resilience of the Great Barrier Reef — including in-park management and efforts to address external drivers, such as climate change and degraded water quality — are actively supported by all sectors of society. Awareness and momentum for action are increasing as Reef partners and the broader community work together in promoting clear and consistent messages about the urgent need to tackle climate change, improve water quality and build Reef resilience through on-ground actions in the Marine Park. The use of targeted digital campaigns aimed at reducing threats to the Reef is growing. The International Coral Reef Initiative (ICRI) declaration of 2018 as International Year of the reef (IYOR) has called the global community to make pledges to encourage greater awareness of the threats facing coral ecosystems and adopt simple actions to protect them. New and innovative approaches to widen public engagement are being developed for Australian and international audiences. Growing partnerships across industry sectors and with the community are helping to make threat reduction efforts good for business as well as the environment. Extra funding for the Reef Joint Field Management Program over the next five years will see a growing capacity for marine park rangers to undertake education and awareness activities. New funding is being channelled into establishing more multi-partner projects, programs and forums. Increased collaboration between Reef partners has established greater consensus on the key issues affecting the Reef. These actions can be seen in preparations for the 2019 Outlook Report. Increasing Reef stewardship activities and the telling and sharing of stories are helping people understand the broader personal, social, cultural and inter-generational imperatives of protecting the Reef. More information about our partnerships to protect the Reef.